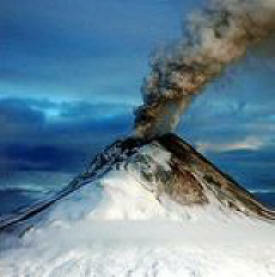 Wrangell volcano is located in eastern Alaska. 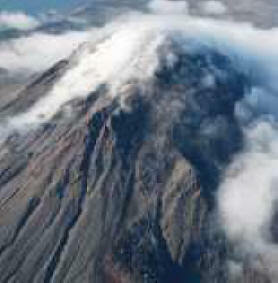 It is one of the world's largest continental volcanoes with a diameter of 30 km and a volume of 900 cu km. 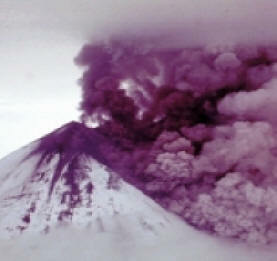 The 1899 eruption of Wrangell Volcano was triggered by a magnitude 8.3 earthquake on the same day. Mt. Wrangell shook with at least 12 tiny earthquakes as the energy waves from the great Sumatra earthquake of December 26, 2004 passed through the mountain during a 10 minute-period. Covering over 2,000 square miles, the Wrangell Volcanic Field is made up of thousands of lava flows and some of the highest peaks in North America, and includes Mount Wrangell. The Wrangell volcanoes were formed over the last 5 million years by massive eruptions which were the result of tectonic collisions along the Pacific and North American crustal plates. 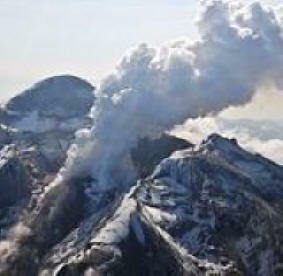 Although this activity has slowed for the past few thousand years, there is still heat at depth, as evidenced by Mount Wrangell's steam plumes, and the series of active mud volcanoes east of Glennallen. Wrangell is the only volcano in the Wrangell Volcanic Field to have had historically recorded eruptions, generally in the form of small steam and ash explosions. The amount of geothermal heat being emitted by Wrangell has been increasing since the 1950s, raising the possibility of a future eruption. Also, the heat flux has been high enough to melt ice around the craters and create ice caves. Modern Mount Wrangell, built upon the remnants of a mid-Pleistocene volcano, has an eruptive history spanning from 750,000 years ago to minor phreatic eruptions in 1884. An ice-filled caldera 2.5 by 3.7 miles (4 by 6 km) in diameter lies at the top of Wrangell's broad shield. The caldera was apparently formed by subsidence rather than large explosive eruptions. The caldera is in turn rimmed by three small craters, which often display fumarolic activity with steam plumes that can sometimes be seen from a distance. 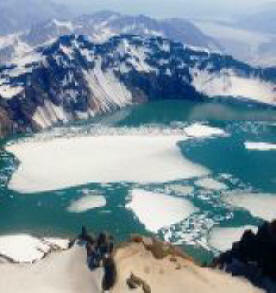 The main summit is on the north side of the caldera, while the west summit rises to 14,013 feet (4,271 m). The summit region above 13,000 feet (4,000 m) in elevation is over 2 by 5 miles (3 by 8 km) in size. 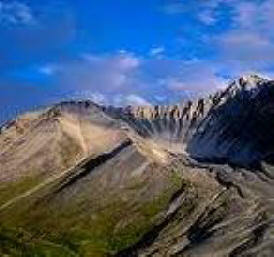 All the volcanoes of the western Wrangell Mountains are less than 5 million years old. Their ages record a progression in volcanic activity from Mount Blackburn (3-4.5million years old) in the southeast to Mount Drum (O.2—O.5 million years old) in the northwest. 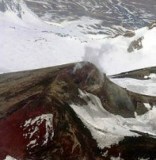 Mount Wrangell, which has fumaroles on its summit and is considered an active volcano, may have erupted lava flows as recently as50,000 years ago, but reliable data to fully verify this young age are unavailable. Farther to the southeast, in the eastern Wrangell Mountains and the St. Elias Mountains, the volcanoes are progressively older. The earliest known volcanic activity in the Wrangell volcanic field occurred about 26 million years ago near the Alaska-Yukon Territory boundary. Mount Wrangell was the first of the higher volcano mountains to be climbed, It is also the site of numerous scientific experiments. 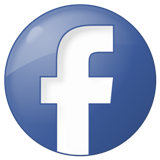 The ease of access and its high northern latitude combine to make Mt. Wrangell an ideal laboratory environment. In 1953 it was used by Terry Moore, then President of the University of Alaska, to study cosmic rays. Since then over 100 ski- plane landings have been made on Mt. Wrangell for science experimentation.